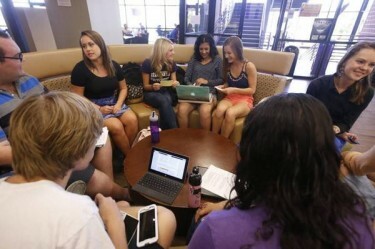 Like nearly everything on campus, GCU's Honors College is growing fast. The college, which changed from the Honors Institute to Honors College in June, will have a total enrollment of more than 700 students this fall, 11-times its size at inception three years ago, including 467 incoming freshmen with an average GPA of 4.16. Also new this year, Juniper Hall will be the first dedicated housing for Honors students on campus. The rapid growth has brought added benefits to students and increased GCU’s status as a quality academic institution. Read more about the Honors College and what students are experiencing here. Things tend to move pretty fast at Grand Canyon University and that speedy progress is evident in the evolution of the GCU Honors College. Formerly known as the Honors Institute, the Honors College will welcome 467 freshman this year to increase its total enrollment to more than 700 students, 11 times its enrollment from three years ago. The Honors College’s growth has brought academic success and more recognition on campus. The average high school GPA for incoming freshmen is 4.16, while current honors students have an average GPA of 3.71. This year, honors students will have a dedicated dorm (Juniper Hall) for the first time. The Honors College will increase to more than 700 students, up from nearly 300 last year, and have its first dedicated residence hall on campus. Breanna Naegeli (formerly Breanna Boling), Honors College program manager, said the growth has come quicker than expected. “GCU has grown substantially year after year and the goal of the Honors College has been to have 5 to 7 percent of the total student population involved,” said Naegeli, a former softball player and honors student at Bethany College in Lindsborg, Kansas. “We are 6 percent this year, which is the first time we’ve been able to meet that goal,” she added. Tuition for honors colleges at state universities is about $1,000 extra, though GCU doesn’t charge any additional fees. Naegeli said the University aims to provide honors students with small class sizes, dedicated full-time honors faculty members and an intimate community emphasis. The growth of the college and faculty means more opportunities for students to succeed. Students not only benefit from more rigorous coursework, but also from relationships with faculty who help students develop interview skills, build resumes and portfolios and make professional connections. GCU’s College of Science, Engineering and Technology also will see a boost this year as a result of the Honors College’s growth. CSET will have 261 students, nearly 60 percent of the total honors student population, with many students involved in challenging programs like engineering, computer science, biology pre-medical and other health care undergraduate programs. The College of Nursing and Health Care Professions and Colangelo College of Business are second with 138 students apiece. Athletics, which had 22 athletes enrolled in the Honors College last year, is expected to see an increase, as well. The Honors College also offers academic-focused extracurricular activities as ways for students to learn outside the classroom. Last year, 25 students had the opportunity to travel to eight countries in Western Europe and hear from numerous speakers, like Phoenix sports icon Jerry Colangelo, and meet to propose ideas for University improvement. Students have competed in and won titles in various organizations, like NCAA athletics, DECA, Speech and Debate, Miss Arizona and others. John Fernandes, a 20-year-old Christian Studies junior, has experienced the growth of the Honors College firsthand. 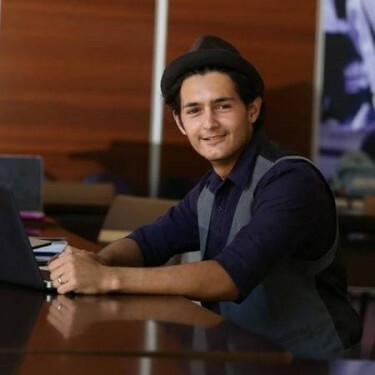 John Fernandes, a junior, was one of the origional 60 in the GCU Honors College. He was one of the original 60 honors students and serves on the Institutional Effectiveness Marketing and Public Relations Committee. The Glendale native and Phoenix Country Day School graduate was set to earn his GCU bachelor’s degree in two years, so he took on a second degree in psychology to stay on campus for four years. He said the relationships he built through the Honors College and the mentoring he received from professors have proven invaluable. “It’s pretty awesome to see the community in our small group, but then at the same time see it grow and become a part of the larger population and begin to make a name on campus,” Fernandes said.